known to have a website as of April 2005. During April 2005 all of these URLs were tested and found to be valid. At that time, "the former Kings County District School Board"
became part of the Annapolis Valley Regional School Board. Elementary School building on Highbury Road in New Minas. about what courses are offered in that school! replacing the old Windsor Regional High School. but on 28 April 2005 the WRHS website was still in operation. Hants West Rural High School ceased operating as a high school in June 2003, and was officially closed on 5 July 2003. Beginning in September 2003, local students attending grades 10-12 went to the new Avon View High School in Windsor. The former Hants West Rural High School building was converted to West Hants Middle School (7-9), which opened for classes in September 2003.
it was still available on 28 April 2005, at http://www.go.ednet.ns.ca/hantswest/. North Highlands Elementary opened in September 2000, replacing Dingwall Elementary and Highland Consolidated. 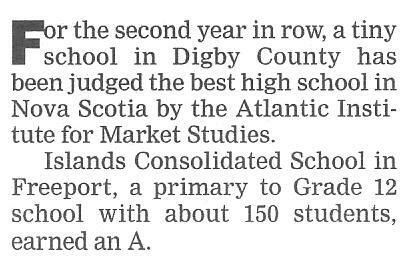 It serves students from Meat Cove to Smelt Brook. Cape Smokey Elementary opened in September 2000, replacing Ingonish Beach School, Ingonish Consolidated and Neil's Harbour Elementary. It serves students from Cape Smokey to Smelt Brook. St. Joseph's Elementary (below) is another. Harbourside is a new P3 (Public Private Partnership) school of P-6 students located on the old Don Bosco Elementary School site in Whitney Pier. replacing Colby, Sacred Heart, and St. Joseph schools. The official opening ceremony was held on 7 February 2005.
but 25 April 2005 the SHES website was still in operation. Ashby Elementary School opened in September 2004. This website remembers an elementary school which closed in 1985.
including class pictures and images of 1970s report cards. This school website contains a highly desirable feature — an explanation of where the school's name came from. Many schools are named for a person, but hardly ever does the website of such a school contain any information about who the person was, or why he/she was chosen for this honour. remains in operation, and the hit counter still works. This school provides a map in its website, to show the viewer where it is located — an enlightened policy which I wish more schools would emulate. This website started operation on 23 February 2005. This new school is now (April 2005) under construction; scheduled to open in September 2005.
to Inglis St. Elementary School from St. Francis Elementary School. This new school, scheduled to open in September 2006, is the replacement for Sir John A. Macdonald High. The present Sir John A. Macdonald High School building will be converted to a Junior High School. Likely completion date: Spring 2007. This new high school will replace the existing Queen Elizabeth and St. Patrick's High Schools. from École R.C. Gordon to École Rose des Vents. 305 schools and school boards listed, as of 28 April 2005. 415 schools listed, as of 28 April 2005. 67 schools listed, as of 28 April 2005. 69 schools listed, as of 28 April 2005. Effective 1 August 2004, the Southwest Regional School Board was officially split into the South Shore Regional and Tri-County Regional School Boards. The earlier split in 2000 was experimental. The later split in 2004 implemented the split permanently. This website was launched on 17 November 2004. All of the URLs above were valid when checked in April 2005.